For online maps, see the links section at the bottom of this page. The trailhead is officially at the 29.7 kilometre point on Highway 60, meaning it is that distance from the western side of the park. Travelling from the east on Highway 60, access to the trail head is roughly 33 kilometres from the town of Whitney . At the 5.4 kilometre mark out of Whitney, you'll pass under the arches of the park's East Gate. There are some excellent washrooms here. If you need to get cleaned up after your walk, it's open all night in the summer. If you're heading west, pay more attention as you see information for Lake of Two Rivers, which is on the south side of the highway. As soon as you see the Mew Lake Campground sign (to the south) you're almost there. 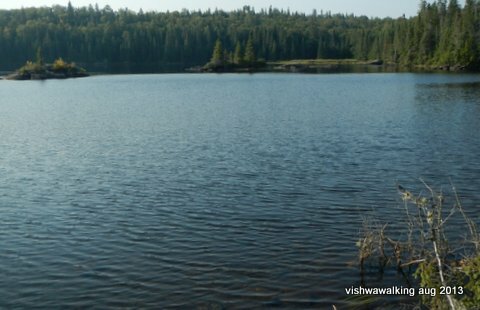 Mew Lake is the closest office to the trail where you can get permits and information. Coming in from the west (heading east) on Highway 60, the trailhead is about 73.5 kilometres from the junction of Highway 60 and Highway 11 on the northern outskirsts of Huntsville. It's 60 kilometres from the village of Dwight. Before I begin my description of this trail, a confession: I walked this trail in one day. The general recommendation is to take it on as at least an overnight hike, or for four days for a more relaxed walk. Most sources list it as "challenging." There are a number of ups an downs on the trail and some short but steep rocky bits. The entire trail, including the 2.5-kilometre connecting link along the south edge of Provoking Lake, (I had to walk the link twice to allow me to get back to the larger loop) adds up to 40 kilometres. I don't recommend walking it in a day. However, when I arrived at the park at 7. p.m. on a Wednesday, it was too late to get into a backcountry camping site. It costs $11.87 (including tax) to camp at a backcountry site. This includes parking for one vehicle. 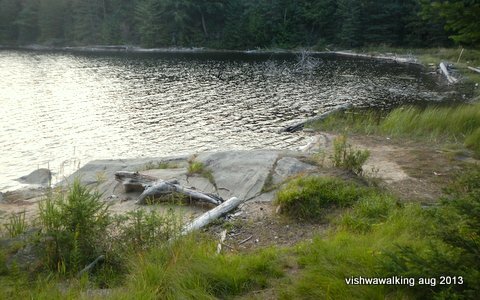 Carside camping at nearby Mew Lake is $42.09. If you book three days in advance, all is well: you can call 888-668-7275 and book a site. They'll send you an email with a permit; print two hard copies, one to leave on your car dash and another to carry with you. Alternatively, you can pick up a permit at the Mew Lake campground. If you head off on impulse as I did, then you will have to wait to get a pass at the Mew Lake entrance office, which does not open unitl 8:30 a.m. That precludes an early start. 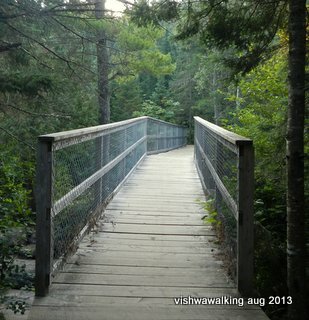 So thus it was that, having a provincial park summer day pass ($117 for one car's day access to any provincial park, the card is not assigned to any one car), I decided to walk the whole trail in a day. It's possible to do, but you must be fit, be willing to bypass leisurely hours by some fine lakes, and not mind a bit of hiking in the dark. Oh, and if you're like me your legs will talk to you for days after. I'm a fit 63, so it's not impossible, just slightly absurd. To save the park's $42 suburban camping fee, I camped by my car near Whitney, outside the park on a beautiful evening. The scrubby backcountry road was no prize, but the price was right and when the moon came up, the whole forest was lit with a glow you could almost read a book by. At 6 a.m. next morning I was on an empty Highway #60 into the park. The moon and the early light of dawn were both at work. 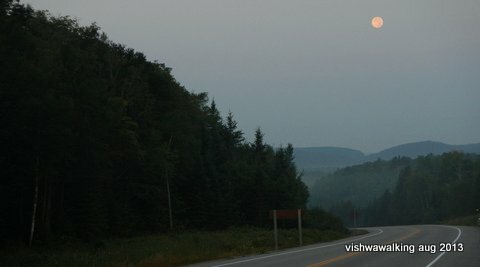 The moon and the misty rolling hills of Algonquin, at 6 a.m. August 22, 2013. After a leisurely breakfast by my car, I set off I at 7:30. The early part of the trail is a 3.9 kilometre link to the actual loop. Remember this section; if, like me, you return in the evening, you'll be doing it in the dark. Right off the top, there's a steady climb with lots of roots ready to snag your boots; otherwise, it's a clear, wide and relatively easy trail. It runs in a south-easterly direction. Although you'll never see it, you'll be tucking under the western side of Lake of Two Rivers before the trail turns more southerly. Right off the top, the mosquitoes, deer fly and gnats set in. They would be with me all day, leaving my shirt sleeves red with insects squashed halfway through their meal. I didn't bring insect repellant; in mid-August this was a big mistake. The hill crests to give you a fair view of the woods and bogs below. Early on, the trail of sand or pine needles is through coniferous woods. 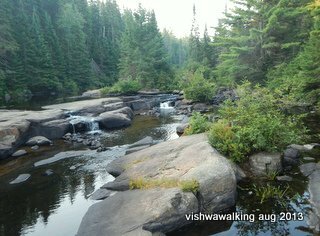 Then it drops to cross the track and tower trail, followed by a sturdy bridge over the Madawaska River, (around 2 kilometres in) with a small waterfall and rapids to the west. There's a bench by the side of the bridge, but it was too early for me to stop and contemplate; the mosquitoes might have put a dull edge on that anyway. Left: Bridge over the Madawaska at about the two kilometre point. Below: a view from the bridge with a little set of rapids west of the bridge. 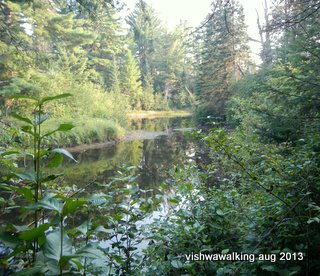 From here, the trail winds along a sandy path near the Madawaska. After crossing a second road/track the trail has a steep climb. The Madawaska south-east of where the trail crosses the river. It heads straight up with some smooth rock faces. Hang in; it's not really that long. After that, the trail cruises along to Starling Lake, which will be on your left as you travel south. It's a small, lily-pad covered lake. After briefly following the south shore of the lake, then turns sharply right, again up a steep hill. After this, you'll reach the first trail junction, at point 3.9 kilometres. If you're tackling the shorter 19-kilometre loop around Provoking Lake, you can choose to travel clockwise (left) or anticlockwise (right). in handy in these situations. loop. If (like me) you are considering the longer loop, it's very wise. I went anticlockwise, although one source (Jeff's maps, see link below) believes that you'll meet meet fewer people travelling clockwise. Travelling anti-clockwise, the trail now turns south-west and is fairly flat as it travels around Provoking Lake. Less than half a kilometre gets you to the first sidetrail east to a Provoking Lake campsite. There are three sidetrails at this point, fairly close together. Officially, the first leads to three campsites, the second to four and the final one to a separate campsite. In fact, I would hope that campers play it fairly loosely here, camping where they feel the time and situation works best (within the campsites but not necessarily strictly as laid out on the map). This is one of the drawbacks of having to camp where the permit says: it forces campers to walk further than they might want to walk, or to stop short when they still have the urge to push on. I have no experience in this area as far as this park is concerned, but I urge a relaxed attitude. At the 1.7 point from the 1st loop junction, you have a choice. Head left (east) and you can circle Provoking Lake for the 19-kilometre short loop. Head right and you are committed to the longer 35-kilometre loop. I planned to do the longer route, but headed east to complete the 2.5 kilometre link that connects the larger loop and that runs along the southern shores of Provoking lake. 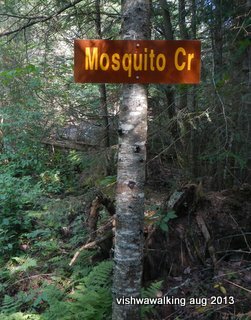 It involves a lot of ups and downs and lowland where the mosquitoes hang out. 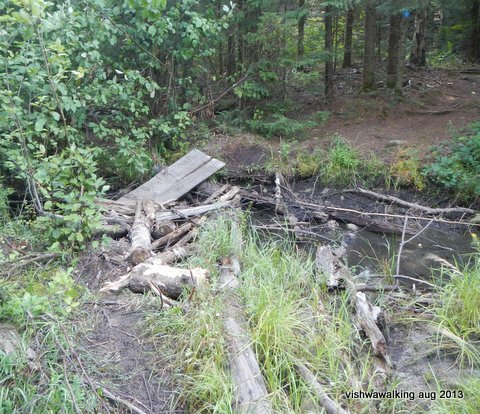 A couple of the wooden planks and bridges were in rough shape, which is no problem for this time of year, but might be an issue in wetter seasons. When I reached the eastern side of the loop, I turned and headed back to continue my hike down the western side of the loop. I knew that if I left this 5-kilometre round trip to later in the day when I was just thinking of getting back to my car, I'd be in no mood to take on a superflous five kilometres. From the junction, which I arrived at for the second time at about 10:20 a.m., I hiked a relatively uneventful 7.3 kilometres to Head Lake. Not long past the junction, there's a side trail to the west to Faya Lake, where there is a campsite. generally pretty dry. Notice the blue marker on a tree in the upper right corner. These markers indicate the 19-kilometre loop. Here's a 9-minute YouTube with videos of the trail from the trailhead to Faya Lake. It looks like a fine campsite. At Head Lake I met a hiker named Brad who was having serious muscle spasms. He was in need of water, but had no filter. He had camped on Provoking Lake and I had briefly seen him earlier there. He was carrying a 50-pound-plus backpack with straps that were giving out. I filled his bottles with water along with mine. I had already gone through two-and-a-half litres of water. We had a good chat. Brad thought it best that he rest for as couple fo hours. He had booked a second campsite for the evening on Harness Lake. Brad said he was visited by a small black bear the night before, on Provoking Lake. He said he frightened him off by banging on pots with his machete (!) and by shouting. There are several good campsites on the north side of Head Lake. The first is conveniently near the lake, but also right on the trail. The last is on the far eastern arm of the lake. The park seems to separate hiker campsites from canoeist campsites. I noted the campsites on the map, but don't really know if there are differences. I took my first break of about 20 minutes with Brad, then moved on. Only now did I realize that I really could not pause long if I was to make it back at any reasonable hour. 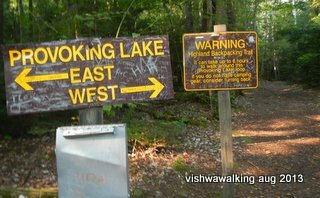 The next section of the trail was my favourite, with glimpses of Head Lake to the south followed by Harness Lake. I passed several side trails leading to campsites on Head, followed by a brief stretch before encountering more sidetrails to Harness. At the 4.1 point, the trail heads back north, about halfway along Harness Lake, whose length runs roughly north to south. There's a fine campsite here. I rested for another 20 minutes, where I met three young hikers from Paris. They decided to camp here. One of the Parisians had a hammock. When I travel alone, I usually use my Hennessey Hammock. However, here was a guy who made a hammock out of a cheap sheet and a couple of tennis balls. Brilliant. I started north from Harness Lake just before 3 p.m. I needed to do some serious hiking to get back to my car. The trail roughly follows Mosquitoe Creek at this point. Never was there a more appropriately named creek! 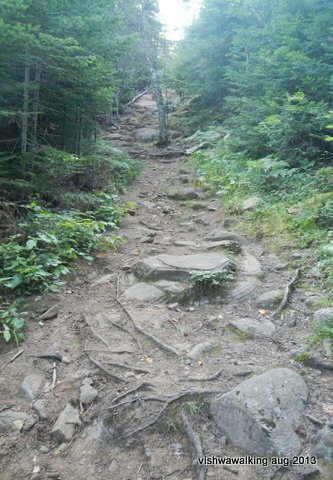 The trail has a few ups and downs and several sharp rocky inclines, but generally you can make good progress here. One online commenter (on the Google map link — see below) mentions that the water between this section of Harness and Provoking is "all stained bog water." S/he suggests boiling water or using a good filter. That seems mandatory for all Algonquin water; however, perhaps this water is particularly "stained." I don't know. To be safe, simply load up with water at harness. At about 5:40, I finally reached the junction with the connecting link trail around Provoking Lake (a point I had reached before in the morning, when I made the 5-kilometre dash across the link). Never was a creek so appropriately named! Harness) through Fly Lake to Whitefish Lake. After a quick text on my cell (reception is intermittant in the area, but was fine here), to tell my wife I was fine but would be late, I set off again. In the next half hour, I found myself in that surrealistic situation, texting back and forth several times with my wife, pausing to let the mosquitoes and deer flies feast while my hands were busy. Strange technology in these deep woods! From the last junction it's about three kilometres to the east end of Provoking Lake. There are a series of camping sites here along the northern edge of the lake. This is a great section of the walk, which I enjoyed, especially since, near the lake, the mass of flies were greatly reduced. The trail follows the lake here, heading west and slightly south. Be careful as you get close to the turn back north; the blue trail signs are far apart and with the various well-trod path to and from camp sites or to the water, it's easy to lose the path. Generally, stick close to the water as the trail hooks up and over the last arm of Provoking Lake to reconnect with the access trail. At the junction to the 3.9-kilometre trek home, you'll recognize features from your walk in. For me, it got dark enough that I had to use my flashlight for the last two kilometres. At that point (at the top of the first big hill), the trail is wide and well-used. Just before the trail leaves the top of Provoking Lake it passes a little beach. miles to go before I sleep, I had to pass. So ended my trip, at 9:30 p.m. Straight walking, with less than an hour in total for three breaks. After only half an hour sitting in my car, my legs were so stiff I was walking with a slow limping shuffle. Again, walk this trail over a few days if you really want to enjoy it. Overall, it's a challenging trail. I could have used fewer sections walking near mosquitoe-infested bogs. Provoking, Head and Harness lakes were beautiful. At places, trail signage could have been better, but the trail is generally very clear. Because of time, I missed the Starling Lake lookout, which apparently gives you a great view of both Starling and Lake of two Rivers. Here's a video of of someone who walked it; skip to the 1.40 minute point to see the lookout. Rating: This is a strenuous walk. To find the trail on any map, follow Highway #60, which runs through the south of the park. For the location on Highway 60, see the description a the top of this page. You can buy the official backpacking trails brochure in the park or order it online from the Friends. It has decent maps of the three overnight backpacking trails. At $1.95 it's a fair purchase. However, much of the brochure is padding: all kinds of (useful) advice concerning general hiking practice and safety doesn't need to be hauled around on the actual walk.